Begin with the idea that mealtimes are pleasant and that good behavior makes them more fun for everyone. Talk with your preschooler about the importance of good manners, and encourage them to think of themselves as a polite person. Set realistic expectations, then gently reinforce them until they become habit. Your child isn't ready for the finer points of well-mannered dining (such as which fork to use for the cake), but they're old enough to start learning and even perform the basics - depending, of course, on whether they've just turned 2 or are approaching kindergarten age. Saying "please" and "thank you"
Some older preschoolers (those who enjoy learning to act "grown up") can handle a few more details. Your child might like to know how to put their napkin in their lap and use it to wipe their mouth, to take small bites, and to chew with their mouth closed. They can learn not to slurp their beverage (by leaving some in the bottom of the glass), to wait until everyone is served before starting to eat, and to comment nicely on the foods they like (but not on those that are "yucky"). Mealtime is a great opportunity for them to polish their communication skills, too, so be sure to include them in discussions. Your preschooler wants to please you, and they want to be like you, so the best way is to show them how it's done. 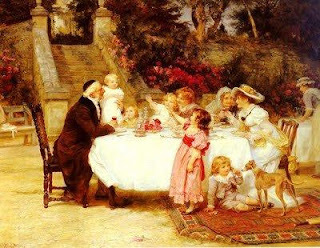 Talk pleasantly at the table - no lectures, arguments, or raised voices. Say "please" and "thank you" when you ask for something to be passed. And don't read the paper, watch television, talk on the phone, or jump up to tend to other things. Show them that good table manners involve showing respect for the other people at the table. Consistency will help make good manners a habit for your child in the coming years, so when you introduce a behavior, set expectations and use gentle reminders to reinforce them. Simply hand your child their spoon when they pick up their cottage cheese with their fingers, and prompt a "thank you" when you refill their water. Give your child strokes for behaving well at the table - when they sit nicely and ask politely, for example. Don't overdo the praise, though, because you don't want them to feel that they're the center of attention whenever you sit down to share a meal. You have a couple of choices. Some parents find it's best to ignore the misbehavior - the demanding, the banging, the mess-making. When this tactic works, it's because the child stops doing whatever gets no response. Other parents find that it's better to find ways to discourage their child's problematic behavior. If your child doesn't say "please," then don't serve that second helping until they do. And some parents simply remove their children from the table when they do things that are unacceptable, explaining that their behavior is not good manners. If you make it enjoyable for your child to share meals with you - by talking with them and being upbeat - then they're more likely to want to stay and share the good vibes. Next time (or eventually, in any case), they won't do things that get them banished. So you'll want to make sure that your child learns to be polite, but there's some leeway on what that means. As they grow, you can teach your child the basics (to say "please" and "thank you," to chew with their mouth closed, to be pleasant) and even some nitty gritty (like which utensil to use and where to put their napkin), but don't get too hung up on formalities. Good manners are really about being considerate of others. If your child keeps that in mind, they'll do fine. There are a couple of rules you might not want to enforce at mealtimes, though. One is the old "clean your plate" rule. You want your child to learn to stop eating when their body says it's full, not when everything in front of them is gone. So offer small portions, refilling as necessary, and respect their decision to stop eating. At this age, you might also forgo the rule about sitting at the table until everybody is finished eating. Your preschooler is still active by nature, and it's likely they just can't sit still that long. A better idea might be to let them ask to be excused whenever they're finished. You might want to say that once they leave, they can't come back for more food, though, so they won't get into that habit of coming and going throughout the meal. thanks for the comment you left on my blog. I sure needed the pep talk. I struggle when more than one of my five children is having strong will issues! Then it feels like it is 5 on 1. . .not good odds. But, my 2nd son was my biggest challenge and he is now a joy! So, I know I can do it. It just wears you down some days! thanks for the comment you left on my blog. We can all use a pep talk every once in awhile. I know God knows I can do it and usually that keeps me going. But the enemy likes to tell me things aren't going well! no toys at the table is a big one for me. My three year old know the deal and always removes them before supper. I think a lot of it has to do with consistency with my oldest (who is six) and him seeing it.